China vs. the US: Who Blinked? Is China caving to the U.S., or is it that Xi has figured out how to handle Obama? As expected, he started with the example of Vice Premier Wang Yang using the analogy of “husband and wife” to describe China-U.S. economic relations during the the fifth round of the U.S.-China Strategic and Economic Dialogue in July 2013. Then he pointed out that in December 2014, at the 25th U.S.-China Joint Commission on Commerce and Trade, Wang remarked that the United States is the leader of the world and “China has neither the intention nor the capability to challenge America’s leading status.” Finally my friend pointed to Premier Li Keqiang’s most recent speech. Just like me, he feigned surprise: “Has Xi bested the U.S.?” I said that since Xi came to power over than two years ago, and especially after the private meeting he had with Obama at the Annenberg Estate in California, neither Obama nor his subordinates have directly complained about China issues, which is quite rare for an American president. “What’s more, the new administration has arrested quite a few people – are you telling me you didn’t notice this?” I asked him. He laughed and said of course the U.S. noticed. He then said, “Since you used to work for an American think tank, you must be following their publications.” He explained that since Xi came to power, all the research reports and predictions about him from U.S. think tanks ended up being quite biased, something we haven’t seen since Deng Xiaoping’s time. We could even say that this is another collective misjudgment from American experts about a socialist power, just as experts misjudged the collapse of the Soviet Union. But luckily, since Xi assumed office, top-level communication between the two countries has been smooth. 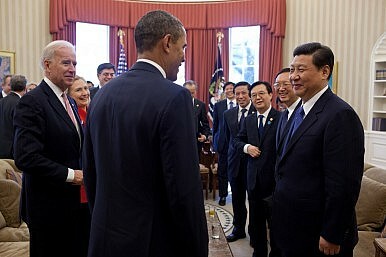 It seems like the two leaders have a tacit agreement – Xi will give Obama some room, while Obama will give Xi some time. So is China caving in to America or has Xi bested the U.S.? Actually, these are two sides of the same coin. Think tanks in the United States are uncertain about Xi’s ability to rule the country, so Obama decided to give him some extra time. Even though there are often problems in the South and East China Seas, in reality China-U.S. relations are experiencing a rare period of calm. This calm period is not only important for Obama, who is weighed down by domestic politics, but is even more crucial for Xi. Xi Jinping is the first leader of the Chinese Communist Party who was not personally appointed by the Party’s first-generation leaders (Mao and Deng) but still he is accepted and liked by the various segments of Chinese society. Xi seems to have assumed office at a time when China is gradually growing strong, but those who see clearly are aware that power was handed to him at a time when China is facing its most critical moment. Economic development has turned sluggish; China’s social problems are growing more acute by the day; the political system generates corruption; the legitimacy of the ruling party faces constant challenges. Any or all of these potential conflicts could suddenly explode during his leadership. Xi cannot afford to maintain the status quo or play the role of a caretaker. Either he will be remembered as the leader who oversaw China’s “rejuvenation” or he will face the “death of the Party and the destruction of the country.” He doesn’t have many choices. Even as the United States’ ability to lead the world grows weaker, the CCP’s ability to lead China is being increasingly compromised by corruption and the failure to reform. Under these conditions, if China challenges the U.S. or the U.S. provokes China, both sides would be overestimating their own strength – and in the end it’s likely that both sides would suffer. There’s no way the leaders of these two countries could fail to see this. Xi’s administration has sent a clear signal to the United States: “You lead the world – I only want to lead China. If you don’t make trouble for me, I won’t cause trouble for you.” As my American friend put it, if you give me some time, I’ll give you some space. The Pacific Ocean is huge and the world is even bigger – China’s night is America’s day. If the U.S. respects China’s choices, China won’t oppose U.S. leadership. The U.S. has always been in the driver’s seat when it comes to the U.S.-China relationship. Right now, there are some obvious variables at play in the generally stable relationship. But the greatest variable isn’t the South China Sea or the East China Sea or even the risk of an incident leading to war in Northeast Asia. The biggest variables will be the success or failure of China’s reforms, the effect of slowing growth on society, and the relationship between China’s rulers and the people. Is China destined to eventually overtake the United States to become the world’s largest economy? Or will it backslide or even crumble when trying to climb out of the pit that many other countries have already escaped? It’s obvious that time is in the hands of the Americans on the other side of the ocean. For China, How Much Will the Outcome of the US Mid-Term Elections Matter? There may be brief respite for Beijing, but long-term competition isn't going anywhere.